Just as rocks and rock strata can tell us the story of geological events that happened hundreds of millions, even billions, of years ago, enabling us to reconstruct episodes in the evolution of our planet, the fossils embedded in rocks enable us to reconstruct a history of life on earth. In New York, the fossil record spans half a billion years. Not all geological periods are represented, but fossils dating to the Ordovocian, Silurian, and Devonian periods of the Paleozoic, and the Cretaceous period of the Mesozoic, are abundant in the New York region. In 1893, a young Yale paleontologist named Charles Emerson Beecher discovered a rich trove of well-preserved Ordovician fossils near Rome, New York, in Oneida County. 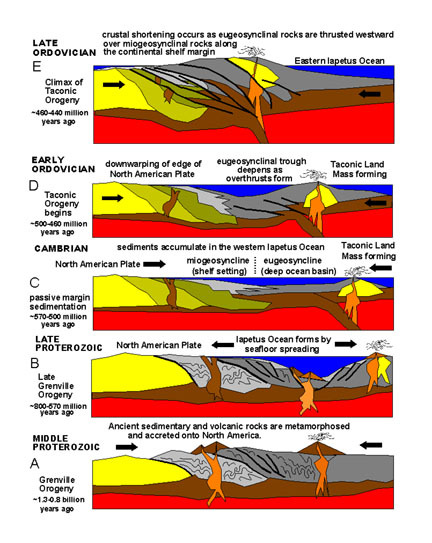 The fossils were preserved in shale, a sedimentary rock that formed in the Taconic Orogeny, a mountain-building event that marked the creation of the the supercontinent Pangaea. As the oceanic plate slid beneath the continental plate of what would become eastern North America, a volcanic island arc formed offshore, its volcanic eruptions spewing ash into a shallow marine basin to the west. By the Late Ordovician, the volcanic island arc collided with the eastern edge of the continent, pushing up mountains and crumpling and deepening the inland marine basin. Over eons, sediments washed down from the mountains into the basin, forming muddy deposits. The deposits of mud and ash that accumulated through tens of millions of years eventually hardened into the fossiliferous shale that Beecher discovered. 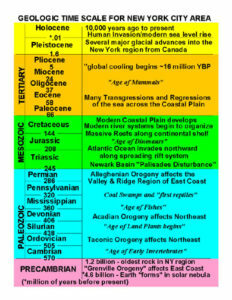 From Beecher’s fossils and other fossil troves in New York we can reconstruct what the New York region was like around 450 million years ago (mya). 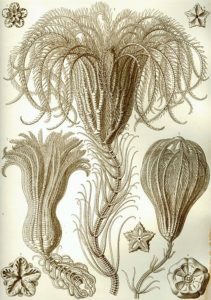 A deep sea covered the region, harboring in its waters a wealth of invertebrate species: many species of trilobites hunted and scavenged the sea floor; worms and clams burrowed in the mud; brachiopods attached themselves to shells that littered the sea floor, opening their valves to filter the water for food; colorful crinoids (sea lilies) waved their flower-like stalks in the sea currents; predatory starfish patrolled the muddy bottom while squid-like nautiloids propelled themselves through the water with their long tentacles, seeking prey; coelenterate polyps built their coral houses on the sea floor while zooids built huge graptolite colonies that floated like rafts on the surface. 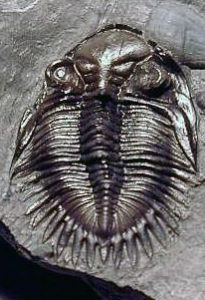 The trilobite species Triarthrus was by far the dominant species, able to survive deep-water environments low in oxygen. They are so beautifully preserved as fossils because iron pyrite present in the muds replaced each part of the organism, not only preserving structural details but imparting a golden sheen (pyrite is “fool’s gold”). During the Silurian, sea levels rose, inundating western and central New York State with an inland sea. The Taconic Highlands continued to erode, shedding sediments into the marine basin, over time forming shale deposits. The most famous deposit of the Silurian period in New York is the Rochester Shale, discovered when excavation was begun for the Erie Canal in the 1820s. James Hall, a paleontologist known for his 8-volume work New York Paleontology (1847-1894), conducted in-depth studies of the fossils. 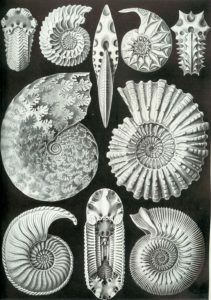 The fossils revealed an abundance of diverse marine animals, including crinoids, annelids (worms), gastropods, mollusks, brachiopods, corals, and trilobites. Most recently, the Rochester Shale exposures at the Caleb Quarry have yielded another rich trove of fossils, mined and catalogued and photographed by a team of paleoontologists: Ray Meyer, Gene Thomas, Kent Smith, Paul Chinnici, Fred Barber and Greg Jennings. The findings are published in a book, The Silurian Experience (2015), edited by Paul Chinnici and Kent Smith. Collecting work near the quarry was begun by Carlton Brett in the late 1970s, when as a doctoral student he discovered fossils in a nearby creek, and was continued by him and his students into the 1990s; when the Caleb Quarry site opened to paleontologists in 1992, a number of fossil experts began collecting and assembling a beautiful record of Silurian life as revealed in the Rochester Shale. Their ongoing enterprise is exhibited on their website primitive worlds.com. During the Middle Devonian, around 387 mya, a shallow tropical sea covered much of New York State west of the Hudson, and the continent’s eastern edge dipped below the equator. Two deposits of limestone known to paleontologists as the Helderberg Group and the Onandaga Limestone were formed in the inland sea. 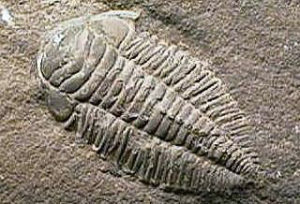 Marine life was still the dominant form of life, and trilobites were still abundant. But invertebrates had begun to crawl onto the land and even take to the skies. 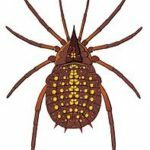 The oldest insect fossils date to 415 mya, trigonotarbids — affectionately known to fossil-hunters as trigs — have features that place them as precursors to spiders, except that they lack poison fangs and spinnerets, and have complex eyes. 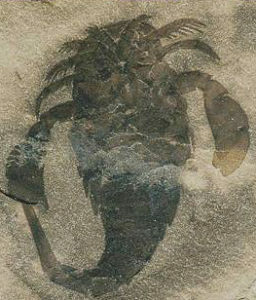 In 370 million-year-old Devonian rocks discovered by Patricia Bonamo and Doug Grierson near Gilboa, a rich fossil trove in central upstate New York, were microscopic mites with hair and claws; false scorpions with pincer-like jaws, specialized teeth, and sensory hairs adapted to air; minute myrapod precursors of the six-foot-long millipede-like insects that rose to dominance in the Carboniferous age; and trigs. All were predatory animals that must have pursued their prey onto land. It’s thought that detritus-eating invertebrates colonized land along with the first land plants, possibly with the Cooksonia that is often found with insect fossils; insects did not develop the mouth parts for eating plants until the Carboniferous 50 million years later. Eophrynus prestvicii reconstruction. Drawn by Buckland, 1837, and colorized by Jason A. Dunlop and Russell J. Garwood. [CC BY 4.0 (https://creativecommons.org/licenses/by/4.0)], via Wikimedia Commons. This trig was found in a coal seam in England dating to the Carboniferous. The Devonian has often been referred to as the Age of Fishes, but this was also the time plants began to colonize land. From the fossils of Gilboa we can reconstruct that early botanical ecosystem. 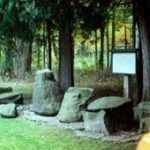 The Gilboa site, now covered by the Gilboa Dam, is famous for its fossilized tree stumps that reveal the earth’s oldest known forest. The petrified stumps, discovered in the early 1920s when they began excavating for the dam, are dated as 385 million years old. Horsetails (Equisetum species). These were photographed in a bog in the Adirondacks. The tropical forest that covered the marshy lowlands was dominated by towering 100-foot-tall club mosses and 50 to 90 foot tall horsetails. 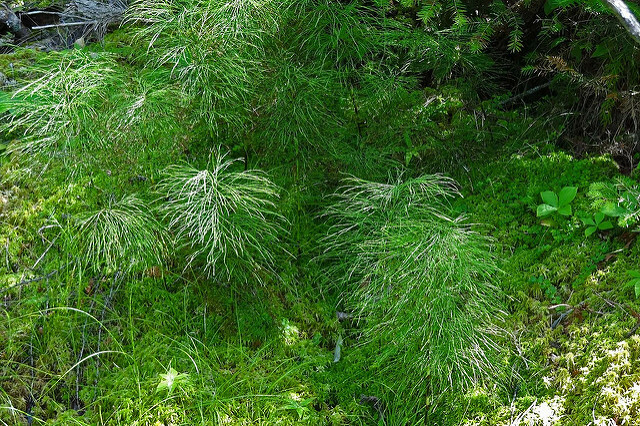 The club-mosses, or lycopsids, were bizarre-looking trees with scaly-barked trunks that bore leaf scars in spiral patterns, flourished branches from their crowns, and sprouted spiky leaves; their descendants are the ground-pines of temperate forests. 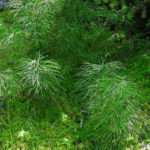 The giant horsetails, or sphenopsids, had trunks jointed like bamboo, with branches extending from each raised joint, or node, and bearing circlets of leaves and cones; their descendants are the little horsetails commonly found along the edges of swamps. These trees reproduced by means of spores, which were dependent on water to reproduce. 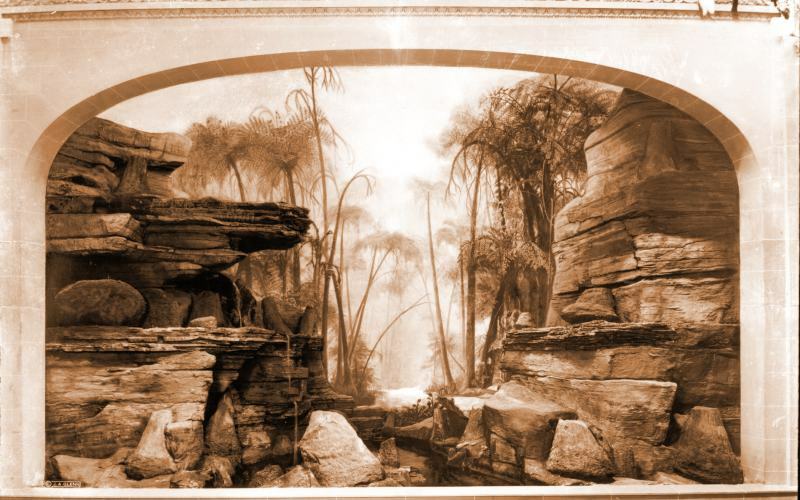 Diorama of the Gilboa Forest created by Winifred Goldring, state paleontologist, in 1924 for the New York State Museum. NYSM Bulletin 252 (1924). Public Domain. Later, during the Mississipian and Pennsylvanian periods (collectively known as the Carboniferous), seed-ferns colonized vast tracts of lowland tracts that extended away from the marshy edges of the sea. The evolution of seeds, which encased the embryonic plants in a protective covering, enabled plants to reproduce in drier habitats. The decayed remains of these trees would be drowned, buried, and compressed in the great coal seams that would fuel the industrial age. Because of severe erosion, no strata or fossils from the Carboniferous are preserved in New York. These primordial forests were inhabited by insects ranging from tiny soil-dwellers (described above) to huge flyers like dragonflies with 30-inch wingspans; amphibians like the carnivorous six-foot-long Eryops, whose descendants are frogs and salamanders; and by the Pennsylvanian, mammal-like reptiles such as the eight-foot-long vegetarian Scutosaurus — an egg-laying precursor of the dinosaur. Just as plants had evolved seeds, animals evolved eggs with hard shells, which freed reptiles from dependency on water to reproduce. When joined to the supercontinent of Pangaea around 250 mya, eastern North America was an arid interior land of rugged mountains and fault-formed valleys. Rainy seasons alternated with dry seasons. Heavy rains flushed sediments down the flanks of mountains into rivers and rift-valley lakes called playas; when dry season came, the lakes shrank and muds baked in the subtropical sun. Across these muds the earliest known dinosaurs — small, meat-eating reptiles — left their three-toed bipedal tracks. In 1909, a fossil dinosaur of Triassic age was unearthed in a sandstone formation beneath basalt at the base of the New Jersey Palisades. William Matthews of the American Museum of Natural History identified it as a phytosaur, and it was named Rutiodon manhattanensis, a crocodile-like phytosaur of the Late Triassic. 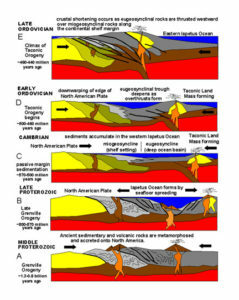 Toward the end of the Triassic, the region became more arid, signaling a major catastrophe: the red beds of the Newark Strata reveal a major change in fossils, marking a global extinction event known as the Triassic-Jurrasic boundary, which marks the onset of the breakup of Pangaea. Huge lava flows erupted from beneath the earth’s crust and poured into the rift valleys. Perhaps the extinction event opened a niche for the dinosaurs, which now emerged as the dominant species on earth. By the Jurassic, the dinosaurs had evolved into the monsters we like to fantasize about: the long-necked, herbivorous sauropods and sharp-toothed carnivorous theropods of the Jurassic; by the Cretaceous, the thundering giants Tyrannosaurus and Gorgosaurus emerged on the scene. Jurassic dinosaur footprint in New Jersey redbeds. c. Otto Zapecza, USGS, 2003. 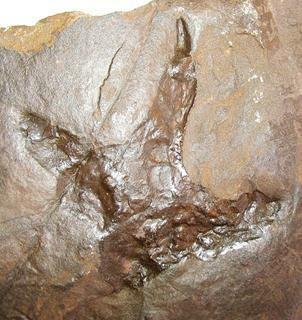 The fossilized tracks of saurischians (“lizard-hipped” dinosaurs) are preserved in the Triassic-Jurassic red beds of the Connecticut River Valley and New Jersey’s Newark Basin, as well as on other continents of Pangaea. 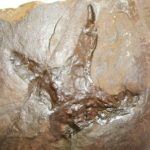 No fossil evidence has been unearthed in our region for the Late Jurassic giants, but fossilized dinosaur footprints dating to the Early Jurassic have been discovered at the Roseland Quarry in Essex County, New Jersey, and at Dinosaur State Park near Rocky Hill, Connecticut, south of Hartford. The oldest known dinosaur bone found in New Jersey Cretaceous formations is that of a 100-million-year-old tyrannosaur’s foot dug from a clay pit along the Delaware River, at Roebling (Burlington County), and the only known Cretaceous footprints were found in the Hampton Cutter Pits at Woodbridge, New Jersey, embedded in the so-called Raritan Formation strata dating to 90 mya. Fossils of Cretaceous flora found on Long Island and adjacent regions, especially New Jersey, are abundant, revealing an incredible diversity of plants. In 1906, paleobotanist Charles Arthur Hollick collected hundreds of fossils from Cretaceous beds in New Jersey and Long Island, identifying 222 species. Many are plants that grow in sub-tropical conditions — eucalyptus, ficus, and cycads — but some we find in our own temperate forests today: sassafras, viburnum, amelanchier, kalmia, magnolia, andromeda, laurel, oak — all grew in the New York region during the Cretaceous period. The Gingko tree, now an exotic botanical specimen and street tree, was once a native tree of the New York Cretaceous. Also contained in the Cretaceous strata are lenses of lignite, a kind of soft coal rich in Cretaceous-age plant fossil fragments, pollen, and spores, microfossils that enable us to reconstruct the plant life of the Late Cretaceous. Between 70 and 65 mya, North America was split in two by a vast inland sea, and the young Atlantic was widening as continents began to assume their present positions. The New York coastal region was a sub-tropical zone with forests, swamps and marshes covering a coastal plain. Many of the plants would be familiar to us, while others are now extinct. 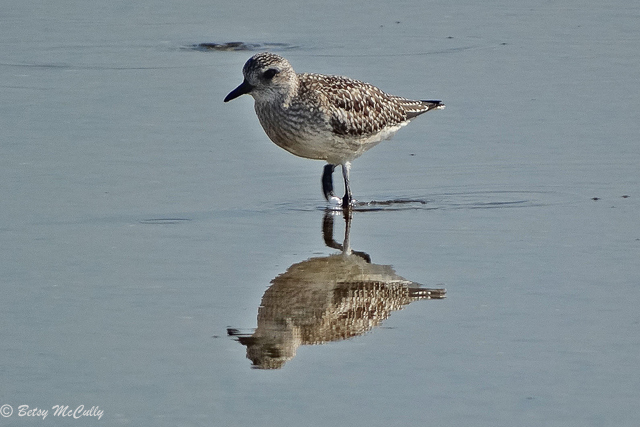 Photo by David Grimaldi, American Museum of Natural History, NJ 667. In 1996, the American Museum of Natural History dispatched an expedition to an undisclosed site in Sayreville, New Jersey. 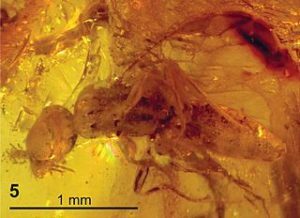 David Grimaldi, then curator of entomology at the museum, and cohorts Kevin Nixon and William Crepet, both of Cornell, discovered a fossil trove preserved in 94-million-year-old amber. 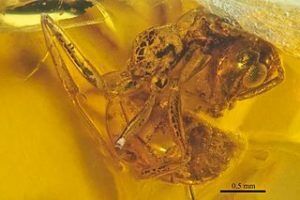 The amber, embedded in ancient clay deposits, revealed 100 species of plants and animals hitherto unknown to science. Insects include ancestral bee and ant species, indicating the co-evolution of flowering plants and some pollinating insects. Among the fossils is the oldest known flowering plant specimen: a 90 million-year-old cluster of tiny oak flowers. To reconstruct Cretaceous animal life, the fossil record in New York is sparse, so we look to the fossil finds in New Jersey and Connecticut. Excavations in the Raritan and Magothy formations of the Late Cretaceous, from Raritan Bay southwestward, have yielded abundant animal fossils, both terrestrial and marine. Geologist William Gallagher of Rutgers University evokes the Late Cretaceous animal world for us in his book, When Dinosaurs Roamed New Jersey (1997). I paraphrase and abbreviate his colorful and detailed description. On the surface of a warm shallow sea floated phytoplankton, dominated by microscopic algae coccolithophorids, so thickly populating the waters that when they died, their minute shells drifted down onto the sea floor, over eons forming deep chalk deposits. At the base of the marine food web because of their ability to convert solar energy into carbon, the phytoplankton were consumed by zooplankton, dominated by shell-secreting foraminifera. The plankton were consumed by oysters, clams, and mussels, and in turn, these shellfish were consumed by skates, rays, and primitive sharks — and a new kind of gastropod, a carnivorous snail, the whelk. Other snails grazed the seafloor for algae, and lobsters and crabs scuttled about. Offshore, cephalopods propelled themselves through the water: prehistoric squids, the belemnites, housed themselves in hollow conical shells known to fossil collectors as squid pens; ammonites encased themselves in their coiled chambered shells. The world starts to look familiar indeed. The extinction event that marked end of the Mesozoic era and beginning of a new geological era, the Cenozoic, dealt a death blow to more than half of marine species and a large percentage of terrestrial species, including all the dinosaurs, except birds. Around 66 mya, a huge asteroid slammed into the earth, creating an enormous crater in Mexico’s Yucatan Peninsula, named Chicxulub. The asteroid, about the size of Manhattan, blasted tons of debris into the atmosphere, blocking the sunlight, triggering a nuclear winter lasting years. The geological record tells us that worldwide, the asteroid’s impact is recorded by a thin layer of iridium, a mineral found in meteorites and rare on earth, known to geologists as the K-Pg boundary (formerly K-T boundary), above which fossils of new species appear. This was the beginning of the Cenozoic era, known as the Age of Mammals. Gallagher, William. When Dinosaurs Roamed New Jersey. New Brunswick, NJ: Rutgers University Press, 1997. Hall, James. 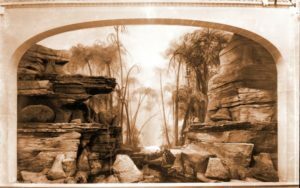 The Paleontology of New York, and Illustrations of Devonian Fossils. 8 volumes. Geological Survey of the State of NY, 1876. Hernick, Linda van Aller. The Gilboa Fossils. New York State Museum Circular 65. Albany: NYS Museum Education Dept., 2003. McCully, Betsy. City at the Water’s Edge: A Natural History of New York. Rutgers/Rivergate, 2007.